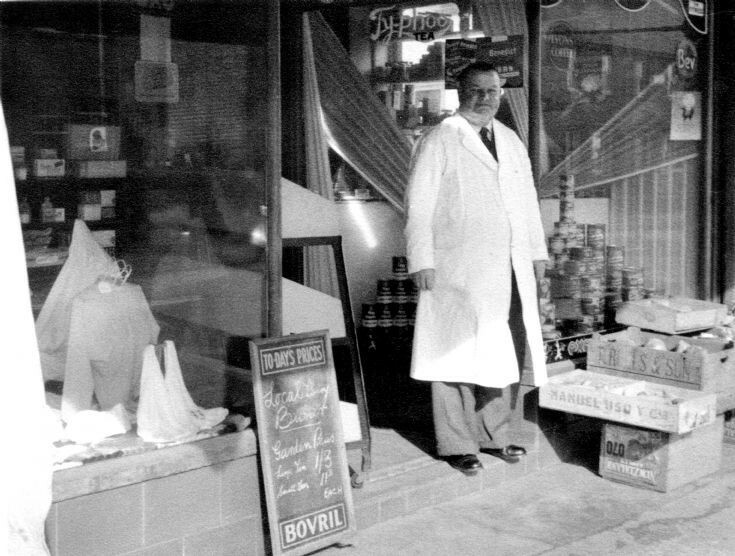 Standing outside Tulley’s Stores and Post Office in Handcross is Harold Tulley (1904-2000) who, with his brother Ralph, took over the business from their father, David Tulley. According to the “Today’s Prices” sign, Local Dairy Butter was for sale and this would have been produced by Devonshire Dairy (picture #1221). Despite the producer’s name, the dairy was located about 100 yards away under the proprietorship of Mr Leslie Moore (picture #1495). In 1928 Harold married Ottilie Furniss at Carshalton. Their marriage certificate states that Harold was a “draper salesman”, and Ottilie was a “draper’s assistant”. How very convenient! Sadly, Ottilie died in 1945 aged just 41. Harold’s second wife was Olive May “Maisy” Powell (b.1926) whom he married in 1948. She survived Harold and as at March 2019 lives in a care home in Bolney. Select Open Document to read a newspaper obituary covering the deaths of two residents of Slaugham parish. The first was Mrs Ottilie Tulley, and the second was Mr Geoffrey Nash who lived in Slaugham village and who was a leading expert in folk dancing and associated music. How strange it is that the obituaries chose not to mention Ottilie’s first names, or neither of their ages. For the record Geoffery Nash was aged 63.